It’s that most wonderful time of the year again: Modern banlist updates. There is no topic in Modern, and arguably no topic in Magic (with one strong contender…), that is so controversial and polarizing as the Modern banlist. Ever since Wizards laid out its vision in two inaugural articles, Modern has been defined by its banlist and their criteria for banning cards. No Modern site, forum, discussion, or Twitch channel (insert KappaHD here) is complete without a healthy, contentious, impassioned, and questionably-reasoned banlist debate. And with the January 19 banlist announcement still fresh in everyone’s minds, it’s hard not to be excited about this coming Monday. Or worried. Or terrified. Looking ahead to Monday, I want to make a few predictions about what might go down at 9 AM on the West Coast, when Wizards launches its announcement and breaks the worldwide Magic internet. But I’d also like to ground those predictions in both the historical context of the banlist, and the current metagame. Anyone can make banlist predictions. Heck, anyone does make banlist predictions. That’s why cards like Bitterblossom sold out for 2 years about seven days before any banlist update. But I want to situate these predictions as part of something bigger than just my niche pet decks (gogo Dread Return!) or my personal vendettas (die Deceiver Exarch). So we will start with some definitions before we get to the fun stuff. Why are cards banned in Modern? At times, it seems like there is a clear set of guidelines that Wizards defined in the early literature on Modern. And at other times, it seems like Wizards doesn’t even know the answer to that question. But we can’t discuss bans at all unless we talk about the criteria for banning a card in the first place. Wizards has made multiple statements on these criteria, but often with inconsistent terms and subjective definitions. It’s up to us to untangle those knots and figure out some common parameters that get a card banned. Well, it’s probably up to Wizards to just be clearer with the public in the first place. But because we might get Unglued 3 before we get that clarity, we have to make do with what we have. Thankfully, we have quite a bit from Wizards of the Coast (WOTC) on this topic. In addition to the seminal “A Modern Proposal” and “Welcome to the Modern World” articles, we have all the banlist announcements Wizards has ever made for the format. Somewhere at the intersection of those articles lies the criteria we are looking for. I always find it hilarious that Modern players, myself included, scour every word Wizards writes on Modern like religious scholars studying their central text. The sheer range of interpretations for the gospel of Wizards is somewhere between deeply impressive and very sad. If we spent as much time building decks as we did arguing about what it means for a deck to “consistently” win before turn 4, we would all be at the Pro Tour by now. But hey, I’ll admit there’s something kind of fun about it, so that’s probably why we all persist. Or maybe it’s infuriating; the line between the two often blurs with Modern banlist discussion. Based on the different sources, here are the four criteria for banning a card in Modern. This will be review for some and new for others, but either way it’s important we are all on the same page. 1. THE TURN 4 RULE: Top-tier decks can’t consistently win before turn 4. 2. DECK DIVERSITY: No deck can be greater than a certain percentage of the metagame for a sustained period of time. No deck can push out other decks below a certain percentage. 3. CARD DIVERSITY: No card can be so strong that you must play that card if you are playing its colors. 4. TOURNAMENT LOGISTICS: Decks can’t cause rounds to go to time. Unfortunately, having these definitions doesn’t necessarily give us more clarity. When does “deck diversity” become a problem” What does it mean for a deck to “consistently” win before turn 4? Why is only one card banned under the “Card Diversity” reason? These kinds of questions are hard for us to answer without some special insight into the WOTC’s R&D 8Ball; we know that there are probably some hard or soft cutoffs for deck percentage or turn 3 win percentage, but we just don’t know what those cutoffs are. That said, we can use past bans as “benchmarks” to try and identify some of those standards hidden from the public. For example, when Pod and TC were banned, both decks were over 15% of the metagame. Assuming Wizards has similar metagame statistics to our own (potentially a dangerous assumption but we have to make it), this suggests 15%+ might be a sort of “danger zone” for decks. Similarly, we know that Storm was considered “top tier” at 11% of the metagame. So any deck exceeding that would probably also be considered “top tier” in Wizards books. But this still leads to endless questions. Is 9% top tier? What about 8%? Can a deck be at 15%+ for a few months before falling? How long will Wizards wait to ban cards period? Although we can’t answer those questions with certainty, this in-depth look at the different ban criteria gives us some tools to help understand and predict Wizards ban decisions. We won’t be perfect, but we will be better off than just wildly guessing. The (in)famous January 19 bans targeted three Modern staples for a format-wide shakeup. Treasure Cruise and Dig Through Time may have only been around for a few months, but they left an impression no one will forget anytime soon. Although I personally question the speculative reasoning behind the DTT ban, I understand where both those bans came from and how they targeted the metagame. After all, this was a metagame where TC-powered Delver was making up 15-20% of the metagame at any given time, and a metagame where BGx attrition strategies were all but dead. The rest of the metagame? That was defined by another card that didn’t survive the 1/19 cleanup: Birthing Pod. Pod may have started the season at under 5% of the metagame, but by the time it was banned it was up to 18%. Its prevalence was even higher at GP Day 2s, particularly at GP Omaha. This was hardly the diverse format WOTC wanted, which is why those cards got the axe. Fast forward to today. As you can see in my metagame breakdown earlier this week, our current format is a lot healthier than the one described above. No single deck is over 15% of the metagame (let alone two decks), and no cards are pushing out other strategies. 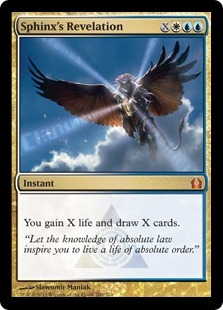 TC, for instance, was singlehandedly invalidating Thoughtseize based BGx attrition strategies, which was an issue if you view those BGx decks as a fundamental policing force in the format. It has been said that TS is the Force of Will of Modern, and I am inclined to believe it (and inclined to believe that Wizards believes it). Delver was also such a strong deck that there wasn’t much incentive to play any other aggressive strategy (except, that is, for TC-powered Burn). Our current metagame doesn’t have those same issues. But that doesn’t mean it lacks problems. Abzan started off as a major danger, clocking at just over 28% of the Pro Tour Fate Reforged day 1 metagame and only falling to 24% for day 2 (note day 2 appears to be 28% as well, but this stat includes a number of Abzan Liege decks; the day 1 stats include fewer Abzan Liege decks). Abzan’s overall metagame stats were about as bad for a few weeks. But since mid-February, they have crept back down to a much more tolerable 13.4%. The Abzan effect, however, is still very much present in the format. As many other writers and players have discussed, Modern appears to have devolved into a format where you play Abzan, which is the best “fair” deck, or you play any of the aggressive and linear strategies that can race and invalidate Abzan. Or Twin, because hey, Twin is always a strong choice. But Burn, Infect, Affinity, and Merfolk collectively make up roughly 30% of the metagame in their own right, which although not crushingly high is still a very different format from Moderns that came earlier. It was less than a year ago where the only viable aggro deck was Affinity, but following GP Kobe and the August 2014 rise of Burn, the scene has definitely shifted. If Abzan, Twin, and the linear aggro/combo decks are succeeding, what decks are doing poorly? The clear loser right now is control. There is some disagreement about what constitutes a control deck in Modern, and although I don’t want to get too much into that, it’s worth bringing up here. “Traditional” draw-go control is all but absent from Modern. Looking at the Top Decks page, the only control decks that aren’t using combo finishes are UWR Control (1.8%), Mono U Tron (1.1%), UW Control (.6%), and a few other control stragglers. All things considered, the traditional draw-go strategy is easily under 5% of the metagame as a whole, and probably under 3%. Even if we add in Scapeshift, a control/combo hybrid that is definitely more of a control deck than is UR Twin (particularly Tempo Twin), that adds only 2.6% to the total control tally. This would still put us under 5% for even the expanded definition of control. There are certainly other archetypes lagging right now, any of which could inform a banlist decision. Jund is only at 2.4% of the metagame, which might play into a Bloodbraid Elf unban. Twin is still the second most-played deck in the format at 11.4% and arguably the “best”; that might play into a decision to keep cards like Ancestral Vision banned for now. But as a whole, this is the metagame context we need to consider when making banlist predictions. I encourage everyone to browse the Top Decks page for more information on the metagame and to either check my own theories, check those of other players, or formulate your own. Now that we are all speaking the same banlist language, let’s look at my two predictions. Just browsing the different articles and conversations on Modern bannings, we see a lot of cards are in line for parole. Or for the chopping block. This includes unbannings (Ancestral Vision! Jace, the Mind Sculptor! Stoneforge Mystic!) and, of course, plenty of bannings (Lightning Bolt! Preemptive ban of Atarka’s Command! Fetchlands! Splinter Twin!). But as I want to discuss below, a lot of these ideas, on both sides of the table, are hard to support with our current data. Based on what the metagame is up to right now, and based on those ban criteria that Wizards subscribes to, I have two scenarios I think are likely. Here they are in order of most likely to least likely. I know what you are thinking: but but but the opening image is Sword of the Meek! The metagame is saturated with Twin and Abzan! Burn, Infect, and linear decks are ruining my life! It’s easy to panic about the Modern metagame when you start combining multiple decks into groupings (“DECKS THAT PLAY CREATURES ARE 70% OF THE FORMAT??! !”), and it’s even easier to panic if you regularly post as part of some online group where ban mania is invariably at fever pitch. But looking at the cold, impersonal metagame stats themselves, this format really isn’t too bad. Neither Twin nor Abzan are at that magical 15% cutoff where decks never survive beyond (Delver, Pod, DRS-era BGx, BBE-era Jund, etc.). Amulet Bloom may have won on turns 1-3 on camera at GP Vancouver and PT Fate Reforged, but the deck is just under 3% of the metagame (note that this ignores its high profile T8 showings, which I’ll touch on in the next scenario). Linear aggro may be enjoying lots of success, but the format is full of innovations like Sultai Control, Abzan Liege, 4 Color Control, etc. These decks might not be big now but WOTC is likely to look at them and see the potential for further results. After all, it has only been 3 months since the last round of cuts. Another huge point in favor of Scenario 1 is the relative lack of major Modern events in the next few months. 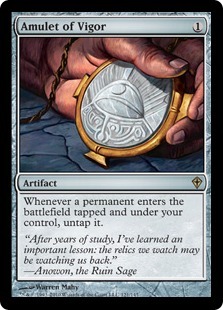 We won’t see Modern GPs until June, and Wizards might want to see how the format has evolved in that time. This is similar to the scenario we saw last year after the massive GP Richmond, when a few decks looked like they were ahead of the rest (chiefly Pod and Twin) but Wizards didn’t act for months. I think this is even more likely following the upheavals of the 1/19 bans, which Wizards is sure to know caused a format wide clamor. Overall, this scenario looks like the likeliest, given Wizards’ track record in the past few years; remember they have never followed a major January ban announcement with further updates since late 2011. This scenario depends 100% on how WOTC views Amulet. On the one hand, Amulet Bloom has less than 3% of the overall metagame. Its online presence is a bit higher (5%), but that isn’t even close to the “top tier” benchmarks around the 10%+ range. But on the other hand, Amulet Bloom has had some commanding finishes at major events in the last few months, and its speed has definitely been a part of that. We know Amulet had the best PT FRF day 1 to day 2 to 18+ point conversion rates of any deck in the format, as well as the best record (thanks to reddit user dafrk3in for that last datapoint!) Amulet Bloom also has the most T8 performances in the past few months relative to its total prevalence at those events. So although it doesn’t have the overall metagame prevalence, Wizards might still consider it “top tier” based on those high profile finishes. If Wizards consider Amulet Bloom to be top tier, then Summer Bloom is likely to get the axe. The choice is obviously between that and Amulet of Vigor, because Wizards won’t risk hurting other decks by banning cards that are useful elsewhere (e.g. Primeval Titan) or cards that feel like strange bans (e.g. Radiant Founta). Weeks ago, I thought Amulet was the likeliest ban, but this doesn’t match Wizards’ style in the past. When they wanted to ban something from Storm during 2011’s PT Philadelphia, they banned cantrips and Rite of Flame, not Grapeshot. When Storm rose again in late 2013, they banned Seething Song and not the mighty Goblin Electromancer. Same thing for Infect with banning the card that made Shoal Infect too fast (Blazing Shoal) and not the infectors themselves. This suggests Wizards wants to ban the cards that make decks fast without killing the decks outright. We see this line of reasoning in lots of bans (e.g. 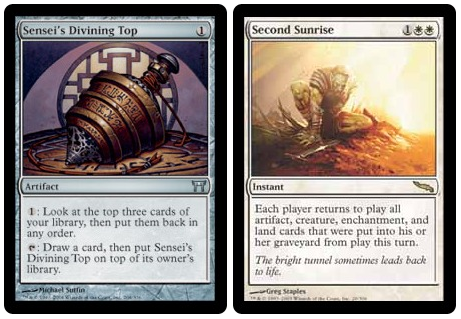 in the Song ban, “The DCI looked for a card that was very important to the turn-three wins but not one of the cards that make this deck unique.”). Bloom is basically the Song of Amulet Bloom, whereas Amulet is basically its Electromancer; it’s a unique effect we will never see again. Wizards is unlikely to want to kill the deck, especially with it being <3% of the format, so Bloom makes more sense as a ban, especially if considered from a historical perspective. 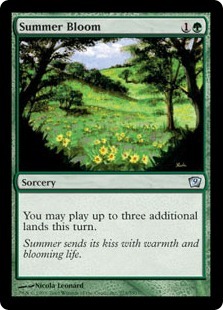 IF (big if) Summer Bloom eats that ban, then I think WOTC will unban something along with it. There are two reasons for this. First, as much as I love dredge, the impact of the Golgari Grave-Troll unban was comical when compared with the enormity of the TC/DTT/Pod bans. I can’t help but think WOTC was holding back unbans for a later announcement, and this seems like good timing now that the metagame is a bit more settled. Second, given how significant those last bans were, I doubt WOTC wants even MOAR bans to sour the format for players. A Bloom ban doesn’t look great on its own but could be cushioned by a more exciting unban. Enter Sword of the Meek. Thopter Foundry eagerly awaits! 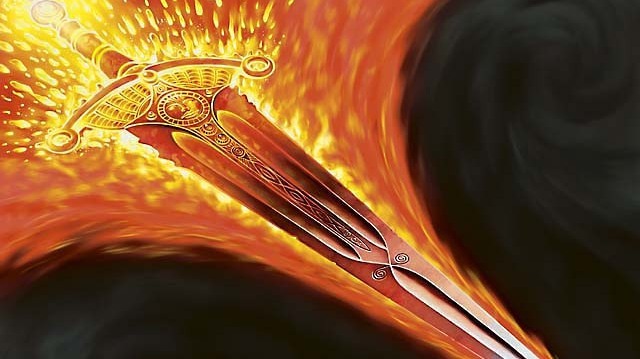 Sword is a great unban because it is unlikely to empower existing decks, it directly goes after the linear aggro decks many people view as detrimental to the format, and it helps a lagging archetype. Let’s start with that first point, which is a big sticking point for me. Sword doesn’t slot into top-tier decks right now, which is something Wizards would probably want to avoid. Abzan doesn’t want this. Burn, Infect, Affinity, and the linear decks definitely don’t want this. A hybrid Twin/Thopter strategy is interesting, but sounds like a mess that would almost certainly be worse than either UR Twin or RUG/Grixis Tempo Twin. It also aligns with previous Wizards unbans (Nacatl, BB, Valakut), none of which slotted into existing top-tier decks but instead created new ones. Moreover, not only isn’t Sword powering up existing top-tier decks; it’s helping those control decks lagging so far behind in the metagame. When you add its impact on the linear aggro decks, hopefully bringing them to a slightly lower share than they currently hold, you have a great candidate for an unbanning. These are certainly not the only changes that might happen. AV is a potential unban contender, but I worry about its synergy in Twin and WOTC’s hesitance to unban a card so similar to two cards they just banned. Or rather, I am worried about WOTC’s perception of its synergy with Twin. There is reason to believe this card wouldn’t break Twin in half, but I doubt Wizards will risk that with the format so freshly remade after the 1/19 bannings. That said, AV is a great way to break up Abzan’s power, but it isn’t clear to me that Abzan at just 13.4% really needs breaking up. DTT is another option in that respect, but I can’t imagine Wizards reversing a ban decision after just 3 months. BBE is another option, but again is one I don’t think is likely. Jund as a single deck practically has a bigger metagame share than all combo-less control decks combined! Abzan is also doing great and Wizards tends to view the two decks as related in the “BGx” supercategory. Does the format really need more BGx? Does it really need more aggressive creatures right now? We may think the answers to these questions are “yes”, but Wizards is more conservative than its playerbase on many counts. It is possible that BBE should be unbanned just for reasons of justice (if Siege Rhino is free, so too should BBE), but I fear there are some assumptions here that might not be good ones. So for now, I doubt we see a BBE unbanning. As for bannings, I just don’t see any metagame justification for anything beyond a Bloom ban. Even the format’s “best” deck, Twin, sits at a very safe metagame share. And even the format’s least fair decks, like Infect, have settled into the metagame without too many issues. If anything, their presence has forced players to shift back to Bolt-based strategies and respect the deck’s power. A Become Immense ban isn’t impossible, but it feels very improbable given the data and how the metagame has incorporated Infect in the past month. Join us again next week as we reflect on the banlist changes (or no changes) that are coming on 3/23. No matter what happens, you can be sure that the Modern community will be going nuts over them. You know what’s a card that would help control decks and not any other archetype? A certain sculptor of minds? Naaah, it will never happen, but one can dream. We will dream together! I think that’s a great shakeup ban after a year of data with no serious headway made in the control issue. But that would definitely be paired with some kind of product release or other major event, because the JTMS hype is just too damn high. The question is whether or not it would make control decks *too* powerful with good removal for high-priority targets AND the best draw spell in the format all in one card. The big thing with sword of the meek is that, even if it’s unbanned, I really can’t see where it would make any real impact on the format. 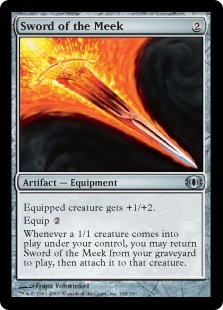 Legacy thopter decks seem to dedicate at least 5 or 6 slots to this combo. It seems ludicrous in this format to be that dedicated to a combo that takes forever to win. Secondly I think the combo suffers from the current meta. When just about every deck in the format sideboards a healthy amount of artifact hate (because of affinity), it’d be almost impossible to make this combo go long. I could see this making a small splash in some kind of gifts shell (maybe Mono blue or UW TRON? ), where you can take up 2 slots for this in the deck or sideboard. The gifts package could be sword, foundry, academy ruins and something else. However, I can’t reasonably see where this moves those two decks into a real competitive position. Both of these cards are effectively dead without their counterpart. I think that modern has had some serious power creep in the past few years and what was overpowered in 2012 is not even competitive anymore. Just look at blood raid elf vs siege rhino…..